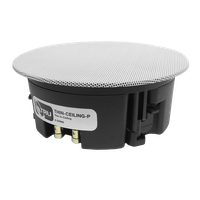 The THIN-Ceiling-P speaker makes it possible to add audio to rooms with limited plenum space. Even with shallow ceilings, the installed depth of the THIN-Ceiling is just 2.38". The included backcan enclosure ensures the drivers have the proper amount of air space to deliver the best performance regardless of the installation environment. Enjoy smooth, accurate sound in just about any room in your home, plus you can paint the Ghost-style frameless grill to blend in with your decor. For more powerful bass, add one of our in-room or in-wall subwoofers. Thin in-ceiling speaker, 5" injected poly woofer, 1" silk soft dome tweeter, includes backbox, less than 2.5" deep, 5-75 watts, 8Ω. Sold each.